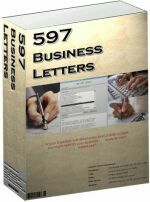 As the name suggest you get for 597 easy to use templates to quickly and easily write a business letter. Here is a list of the templates they have in Alphabetical Order. It is as far as I know, the cheapest business letter templates available. At 2 cents a special price 1 cent per template, a very good value for money as well. Do you need more help in writing your business letters? If you do then the following is the best product for you. Since this site has been up, I haven't been impressed by many products out there. This is the exception. The Instant Business Letter Kit by Shaun Fawcett is the best book out there on the subject. I was going to come up with my own product, but after seeing this, I know I can't even come close. over 400 pages of how-to information, tips, tricks, and real-life templates. You'll discover the two major categories of business letters, and how understanding how they differ will improve the quality of your business letters. You'll learn my "7 Key Steps" for writing better business reports, plus he will share his "two biggest secrets" for writing killer business reports. You'll find out his "6 secret tricks" for keeping 97% of business letters and memos on one page, even when your first draft overflows to a second page. If you need to write a standard business letter and you don't think that any one of the 101 business-letter templates included in the Kit will cover your situation, just let Shaun know and he will draft a one-page letter for you! You can download the fully-formatted templates straight into your word processing program 5 minutes from now and use them as you choose. See for yourself, Click Here now. Now no one can put such a statement out there without asking for trouble. I want to test this out. So, I came up with 10 of my own "zany" situations and modified Shaun's real-life templates from the Instant Business Letter Kit. So, can the templates really fit the most unusual and crazy business situations I can think of? The following free e-book is the result of that experiment. You are welcome to download my free e-book and pass it on to your friends. This e-book is in PDF format. You must have the Adobe Acrobat Reader installed in order to view the PDF file. If you don't already have the Reader installed, download it for free by Clicking Here. To Download This Great Book Click Here now.